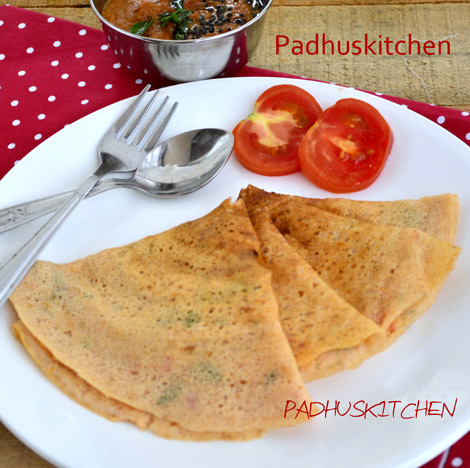 Today I am going to share with you 2 versions of tomato dosa. One is my mother's version, which is instant. You can prepare that if you have idli or dosa batter at home. Suppose you do not have idli or dosa batter at home, then you can opt for the second recipe. Personally I prefer the first one.The second one is good but should be taken hot. I do not like tomato dosa batter prepared with rice alone as I feel the dosa is not soft. Today we will learn how to make tomato dosa following our easy recipe. Mix this with the dosa batter nicely. Our tomato dosa batter is ready. Now we will make dosa. You can add a little finely chopped coriander leaves if preferred. Pour 1 ladle of batter in the center and spread it in a circular motion. Drizzle a tsp of oil around the dosa. Once the dosa is cooked to some extent, flip it over to the other side. Cook the other side also well and serve hot with any chutney or just idli podi. 1.Soak all the above ingredients for 3-4 hours except poha. You can soak poha 15 minutes before grinding. 2.Grind separately tomato, green chilli, cumin/jeera seeds and pearl onions to a fine paste. Keep it aside. After soaking, grind 1 along with poha to a smooth paste. Then add 2 to the ground batter and grind both together for a few minutes. Add salt needed. Let the batter ferment for 5 hours. Then you can use the batter to make tomato dosa as explained above. I have tried this method many times. The dosa is very tasty and soft but should be taken hot. Note - If you like pepper flavor, you can substitute green chillies with whole black pepper. Both the pictures are dosa made from the first method. romba nalla iruku. easy yavum iruku.. try panni parkuren..
looks yummy..wanna eat now itself..
very colourful dosa.happy to follow your Site.Do visit my blog when you have time. Why should poha be added to this recipe?any particular reason? Poha is added to give softness to the dosa. Tried the first version for dinner today and we loved it.. yummy version of the regular dosas.. Thanks for the wonderful recipe .. I tried the method written here.. but i made the batter more watery than required..will it even ferment? How to rectify ? If the batter is too watery, it is difficult to rectify it. Try adding rice flour or make another set of batter and mix both well.